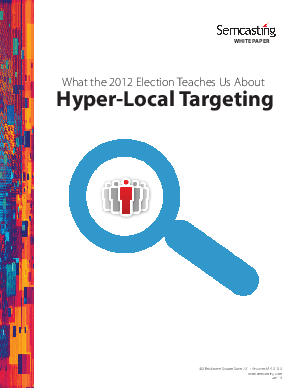 Retail Marketers and politicians look at hyper-local online targeting technologies as a way to attract the right people and bring them to the voting booth or into their stores. Up until now, the default technologies for online advertising have either been dependent on buying specific site inventory or using some form of behavioral targeting. Buying sites or using cookies comes with limitations. Semcasting is changing all this. #1: Cookie-based targeting methods create severe reach limitations - especially for local advertisers. #2: National advertisers limit local market opportunities by reserving prime "Class A" inventory. This artificially inflates CPM prices. As a result, local advertisers get “squeezed” out of many of the best sites based on price and availability. #3: Local advertisers need a systemic approach for finding access to more unique prospects through hyper-local targeting on RTB. As the digital ad space continues to evolve, Marketers will continue to seek out new solutions that will expand reach to more unique prospects. Semcasting’s IP Zones solution helps marketers visualize and define the uniqueness of their customer base, allowing them to create qualified look-alike audience segments. This results in nearly 100% reach which includes comprehensive data accuracy and privacy.